← A REFRESHING NOTE FROM A TRUE PROGRESSIVE! July 17, 2013 By Jack Jodell. This country is tired of politicians continually playing it safe. It kas had its fill of those who choose to pander to their base while actually doing nothing to address the nation’s most pressing needs. Take GOP House Speaker John Boehner for example. Since mid-2010 he has been insisting that “Jobs are the first priority”, yet he has opposed every single congressional effort to formulate and pass a Federal Jobs bill! In his effort to please his party’s despicably ridiculous, reactionary, anti-government Tea Party faction, he has neglected not only his campaign pledge to create new jobs, but the needs of the people who elected him and who pay his salary as well. He has done this merely to hang onto hid personal power. Meanwhile, despite the so-called “improvement” in the economy, millions of Americans remain unemployed or UNDERemployed, and that is simply and totally unacceptable. This is not strength of leadership; rather. it is self-serving weakness! 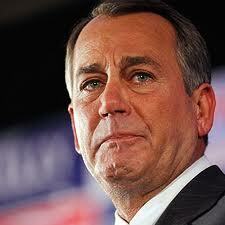 Where are all the good-paying jobs you promised, Boehner? 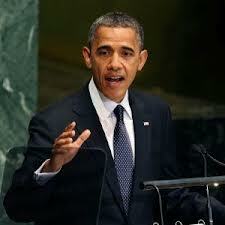 Now let’s consider President Ibama. In many respects, he may correctly be considered as an error-prone, .129 average banjo-hitter who has failed to get the job done many times over. When a strong line drive homer is needed to drive in key runs, he typically hits a weak pop fly or strikes out altogether. Rather than trying to dominate or control Congress as successful Presidents like Reagan, LBJ, or FDR did, he has shied away from that tactic completely. Recently re-elected by a strong margin, he has for the most part remained aloof from Congress and his meager attempts to engage them have been clumsy and feeble – too little, and too late. The steamroller effect of Tea Party-inspired obstruction has all but flattened him, and he has contributed to his own destruction in other ways. His first mistake was to stock his Cabinet with so many Bush-era Wall Street holdovers like Tim Geithner and Ben Bernanke. Doing so guaranteed favorable treatment for Wall Street scoundrels and ensured that Wall Street would be well provided for, but Main Street would be neglected. His second grievous error was to waste pecious time courtong congressional Republicans, when in fact they despised him and everything he stood for. Dozens of his federal appointments remain umconfirmed due to deliberate Republican congressional obstruction, and he sits, powerlessly unable to do anything about it. He has failed in his attempt to close down the nototious Guantanamo prison camp; has failed to get meaningful gun control legislation passed, and appears headed for failure in his attempt to get important immigration legislation passed too. He has failed to arouse fear throughout Congress, and, as a result, is not respected by them and has been relegated to mere caretaker status, with nearly a full second term to go. It is a woeful case of blown advantages and missed opportunities, mainly because he refused to actually fight for his agenda. What’s more, he is nowhere near close to the supposed “Socialist” many on the deluded fringe on the far-right claim him to be. For the most part, he has been dusappointingly moderate and centrist (although you’ll never get any crazy, fanatical Tea Partier to admit it). Let us not overlook the king of Senate Republican obstruction: the pathetically feeble-minded, wholly self-serving Minority Leader Mitch McConnell. What a poor piece of work this jerk has been! He has adapted and deliberately misapplied the filibuster to virtually every piece of Senate legislation, holding up and stalling federal appointments, needlessly wasting Senate time, shamefully wasting MILLIONS of taxpayer dollars on the process, and making a mockery of the Senate as the world’s greatest deliberative body. He has spent a huge amount of his time politicking, and precious little of it governing or actually earning his very bloated paycheck. He has performed more like a lazy, sleeping janitor than an active, concerned Senator. Instead of tending to Senate business, this constipated old joker has been wasting his time attacking perceived political opponents and obstructing important legislation. 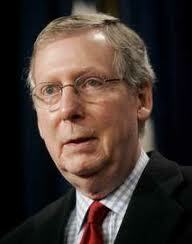 He is a destructive force within our government, and a disgrace to the Senate! 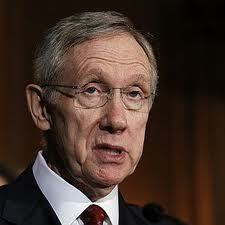 Last, but definitely not least, is the weak and limp-wristed Senate Majority Leader, Harry Reid. Judging by the wimpy way he speaks and “argues” his points, it is very hard to believe he was once a noted boxer. For the political punches he has thrown have been as soft and light as cotton balls and have had the impact of a mere feather. He has failed to overcome McConnell’s preposterous fillibusters, and has failed to muster up enough Senate support to pass much-needed gin control legislation, even in the wake of the recent horrible Sandy Hook elementary school shootings, and with strong support from Vice President Joe Biden. What this country needs in the Srnate today is a strong fighter – not a feather duster. The Tea Party MUST be voted out of office, along with the current far-right, extremist members of the now reactionary Republican Party! They all want to return the country back to the 1890s, when robber barons unquestioningly ran the show. They wish to overturn all the important, pro-worker and pro-people social and economic progress which has been attained since the progressive eras of Teddy Roosevelt and Franlin D. Roosevelt’s New Deal. They are attempting to destroy the middle class and put even more wealth into the hands of the already far-too-piggishly-wealthy uberrich. I’ve said it many times before, and I will keep repeating it until it becomes a reality: WE MUST STOP ELECTING FAR-RIGHT, TEA PARTY-INFESTED REACTIONARY REPUBLICANS to all levels of government! If you want government to actually work as it should (for the benefit of ALL the people – not just the well-connected and privileged few), then start replacing those backward-looking types with PROGRESSIVE candidates! Join the PROGRESSIVE VOTERS OF AMERICA! The “same old, same old” rut we’ve been in no longer cuts it, and this great nation deserves FAR better! This entry was posted in commentary, corporatist, economics, extremists, Politics, Progressives, Tea Party-infested reactionary Republicans, wealth disparity and tagged far-right, Harry Reid, John Boehner, Main Street, Mitch McConnell, President Obama, Progressive Voters of America, uberrich, UNDERemployed, unemployed, Wall Street holdovers. Bookmark the permalink. 2 Responses to THE “SAME OLD, SAME OLD” NO LONGER CUTS IT! “Plus to continue to stand firm on a jobs creation bill that we campaigned on during the election, provided it won’t make the President look good. In this case we will make sure it will not get out of committee, or at least vow to make sure it never comes up for a vote, much less get approved. I think you’ve captured the mindset of these crazy Tea Party-infested reactionary Republicans perfectly. They are indeed a very, very sick bunch.